Nature never fails to amaze. And the best thing about nature is that it doesn't come with special effects. One such example is the glowing forests of Western Ghats, mainly in the states of Maharashtra and Goa, wherein the forest has a green glow at night time. This stunning scenery can be seen in Bhimashankar Wildlife Sanctuary. A forest that glows in the night time is something out of ordinary and rare but it's also not impossible to witness it. During monsoon, the forests of Bhimashankar Wildlife Reserve get completely soaked in rain. If you see it in the day-time, the forest would simply look like any other. However, it is the night time when the real magic happens: the drenched forest lights up. How? You may be wondering. This unusual (yet beautiful phenomenon) is caused by Mycena, a bacteria which is unlike others. It has a unique property of glowing when there is a huge amount of moisture present in the surroundings. These bacterias settle like fungus on branches, twigs, and rotting leaves that are present all over the forest, resulting in the whole forest glowing. This spectacular visual is particularly seen in the little-known village of Ahupe during monsoon. Scientists are still not aware of why the bacteria show a glowing property. The magic, or a natural phenomenon as the scientists would call it is termed as bioluminescence. This is not only found in forests but also in some seas. As of now, scientists don’t know how to predict the next glowing night. But they sure know that when it does happen, it is eye-catching and truly unbelievable. 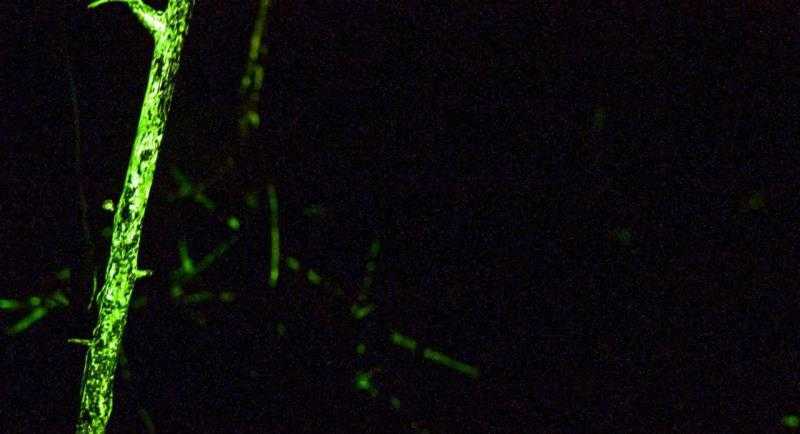 Now, the unique type of bacteria is not the sole reason why forests might glow. The same wildlife sanctuary and other places in the Western Ghats are home to fireflies, another reason why forests light up during night time. This can be best witnessed on a night trek to Rajmachi Fort or Bhandardara. The bioluminescence phenomenon doesn't happen every day. There are chances you might have a wonderful stroke of luck and get to catch the view after an evening of heavy rains in the monsoon months of July, August and September. The fireflies, on the other hand, can be spotted easily in the pre-monsoon months of May and June. Spread over an area of 131 km square, the Bhimashankar Wildlife Reserve is located in the Khed and Ambegaon area of Pune District (Western Ghats). The reserve was created in 1984 for the purpose to save and protect the endangered species of Indian Giant Squirrel. A total of 9 tribal villages are part of this reserve. There's a large variety of flora and fauna found in the area which is endemic to Bhimashankar. Important mammals spotted in the reserve are leopards, striped hyena, golden jackals, barking deer, wild boar, langur, mouse deer. The reserve is also rich in special reptiles, butterflies, insects, and amphibians. Bhimashankar Wildlife Reserve can easily be accessed from roadways and railways. It is located at a distance of 106 km from Pune Railway Station and 226 km from Mumbai Central Station. Trekking trails, wildlife, bioluminescent forests, Bhimashankar Temple (dedicated to Lord Shiva), and much more to choose from on your next visit to Bhimashankar Wildlife Reserve.